As before, get it smooth with just the metronome, then apply it to some tunes. Here's one I've been grooving on recently that works well with this particular pattern. Phew! It's been a busy couple of weeks - gigs, airplanes and the like. But I'm finally sitting down to give you the next installment. I play a lot of different events with Lokalgrown, from concerts to corporate events. This one was for the opening of a brand new apartment complex in Logan. 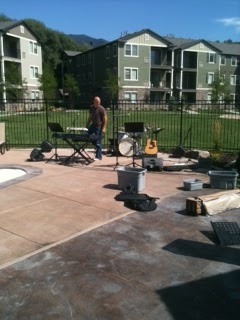 We played by the pool for about five hours (including soundcheck), in the sun the entire time. I should have taken a picture of my sunburned face, but here you get a couple of pre-show looks of the kit and the "stage," as it were. This shot is from the audience point of view, essentially from the pool. We had a few people lounging in the water while we played, but most were in the chairs and at the tables under an umbrella. Complete with raffles and hot dogs, this was a typical summertime party. 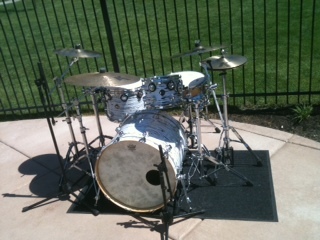 This is just an up close of my kit. It's a little simplified, just the 10 and 14 inch toms. And you can't see it too well, but I used my 4 X 14 natural wood (maple) DW snare instead of the stock one. It gives a little warmer, more open sound because of the satin wood finish rather than the wrap. I've also started using the DW Dog Bones a little more (under the crash to the drummer left), and they are saving a little space and my back when I haul around my hardware bag. Anyway, I hope you're all enjoying your summer as much as I am. I've been asked by some of my students about some of the gigs I play, so I thought it might be fun to post a pic or two from some of them. This gig was last Saturday, August 6, 2011 at Delta High School for the Millard County Fair. This is one of the bands I play with, Lokalgrown. You can check them out here. These shots are just prior to soundcheck, so the stage isn't looking exactly like it did during the actual performance. Please feel free to comment, and ask any questions you'd like to. As with a previous groove, this one looks and feels like it would be hard to apply in a musical setting. But, the more you smooth it out, emphasize the backbeat and just relax into it, you'll find that it can fit a lot more places than you think. Once mastered, try playing this groove along with a handful of recordings from a variety of styles and at different tempos. For example, pick a track from the Fray, Metallica, Count Basie, Frank Sinatra and Beethoven, and make it work.